Custom Dynamics® is recognized all over the world for high-quality products with unmatched customer support. Through vertical acquisitions and product development, the Custom Dynamics® product line is more diverse than ever before; including Harley-Davidson®, Indian®, Can-Am®, and other metric models. In the hopes of making our products more accessible for our customers, we expanded our distribution channel exclusively with Drag Specialties® and Parts Unlimited®, bringing Custom Dynamics® products to dealerships in your neighborhood. Our newly implemented Parts Converter website tool, makes cross referencing our manufacturer part number to the Drag Specialties® or Parts Unlimited® eight-digit part number easier than ever and serves as a great resource for customers sourcing our products locally! If looking to source your favorite Custom Dynamics® product locally, Drag Specialties®, Parts Unlimited®, Parts Canada, and Parts Europe can help you locate a dealer nearest you. Enter your zip code or postal code into the Dealer Locator and find all the dealerships within a chosen mile radius! When you see our products in person, the high-quality design is undeniable. Many customers want to see the products first hand, prior to purchase. Customers can contact these local dealers first to see if they stock Custom Dynamics® products or have displays available. There are five DRAG® warehouses across the U.S. Whether or not the product is in stock when you call, most of these dealerships can have product ordered and available within just 1 to 3 days. This allows you to take advantage of any promotions available through your local dealership. It also gives you the chance to have the shop install the product for you. From purchase to install, our customers can support their local dealership without settling for mediocre products. 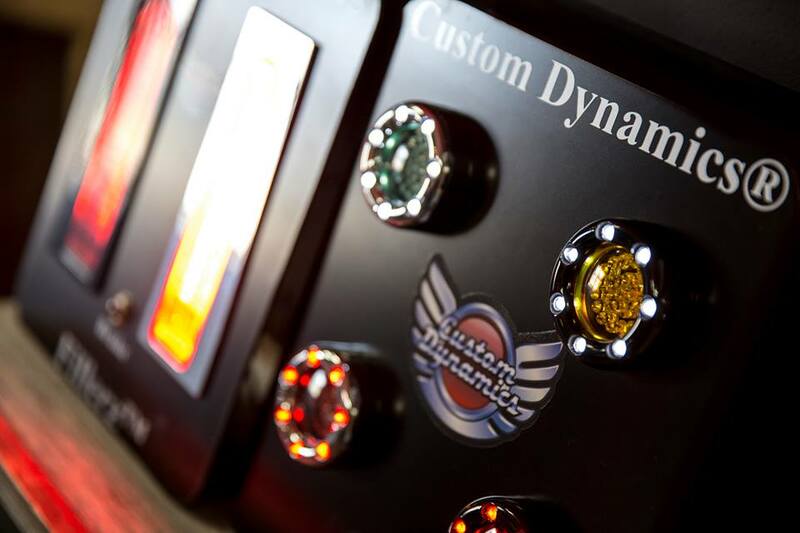 Part of the Custom Dynamics® mission has always been to provide high quality aftermarket lighting products backed by the best warranty and customer support in the industry. Being able to supply local shops with inventory gets the customer their products quicker and riding again sooner! With just a single corporate office and warehouse in North Carolina, Custom Dynamics® has been able to increase the availability of products with Drag Specialties® as their exclusive distributor. The relationship between Custom Dynamics® and DRAG Specialties® has been successful for almost a decade now. Providing dealers across the globe access to our inventory with ease! With an extensive product line, information and applications can be very specific and sometimes complicated. We have worked to compose an arsenal of tools at every dealer’s disposal. Product information, fitment, part numbers, pricing and product specifications are more readily available than ever before. 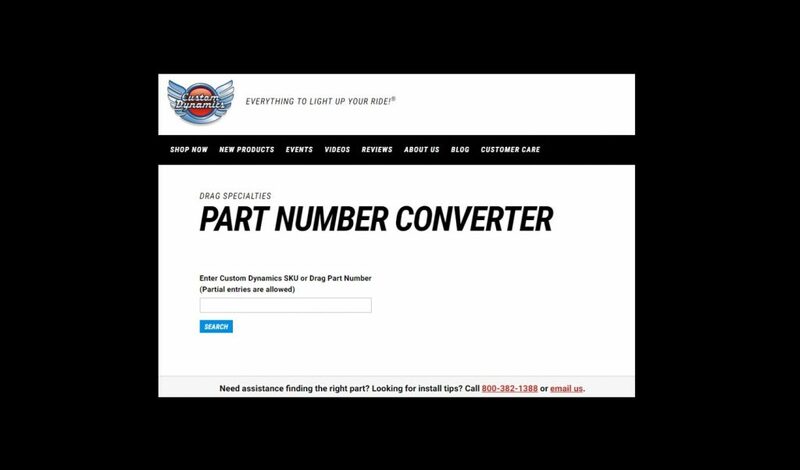 The Part Number Converter Tool is one of the most recent tools now available through the Custom Dynamics® website. This will allow you to search a Custom Dynamics®, Drag Specialties® or Parts Unlimited® part number and cross reference the other. By offering this service, dealers can ensure their part numbers are up to date and correct. Cross Reference materials and a DRAG-specific product catalog have been made available to equip dealers with even more information. The Part Number Converter is also useful for the retail customer. Customers can get an order together, cross reference the part numbers and then order directly from their local shop! With the DRAG® Dealer Locator, customers can even find nearby shops where products can be purchased, and usually installed. The installation is complete and the customer is back to riding. All while supporting local shops! The DRAG® Part Number will also display in the Custom Dynamics® online shopping cart. Dealers will know right away if the product is available via DRAG Specialties®! Not sure of the part number? Partial searches will find all part numbers related to your search entry! We hope this tool and others like it, will make it easier than ever for dealers to choose Custom Dynamics®. Over the past fifteen years, it is clear Custom Dynamics® success is owed to our loyal customers, dealers and supportive distribution channels! We greatly appreciate the support of Drag Specialties® and its dealers. We know supporting local dealers will lead to a thriving industry!